I rarely if ever bring water with me on back-country fishing adventures any more. Instead I bring some type of filter or filter bottle. Technology in this realm has gotten so good and so light there’s simply no reason to pack water in your bag while you’re standing in it all day. While the technology is good, I’ve always found that sucking water through a filter, while effective, was time consuming, and almost always left you wanting an entire mouthful to swallow. 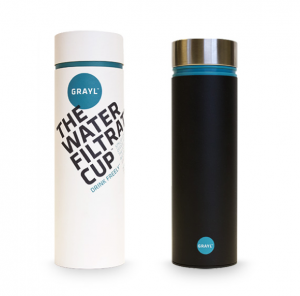 Now it seems that this category of personal water filtration is set to be turned on end with a revolutionary product called the Grayl Filtration Cup. It’s definitely one of those “why didn’t I think of that” kinda products. It’s silly how simple it is to operate, requires no sucking through a filter on your part, holds a good amount of water, and seems to be tough as nails. I’ve been using one at home for a couple of weeks now and am really excited by the prospect of getting it outdoors this summer. You have a choice of two filters. One is just that, a filter which costs $19.95. It filters the usual suspects like bacteria, protozoa, as well as impurities, certain heavy metals, and some industrial and pharmaceutical chemicals. Then there’s the “Purifier,” which costs $39.95, is slower as it has two layers of the filter media/technology, but will get out SARS, hepatitis A, rotovirus, etc., plus a higher level of bacteria and protozoa. Definitely worth the investment if you do a lot of international travel/third world or places where water quality is really unknown. It also wouldn’t be a bad thing to have on hand for disaster preparation.